In the 16th century, a group of humanists, musicians, poets and intellectuals in the city-state of Florence gathered under the patronage of Count Giovanni de Bardi to discuss and guide trends in the arts. They met between 1573 until the late 1580s at the House of Bardi. Members of the group included Giulio Caccini, Pietro Strozzi, and Vincenzo Galilei (the father of the astronomer Galileo Galilei). They called themselves the Florentine Camerata. Among a sea of world-renowned, award-winning choirs in Singapore, we at Vox Camerata distinguish ourselves through our open and inclusive approach to membership recruitment. 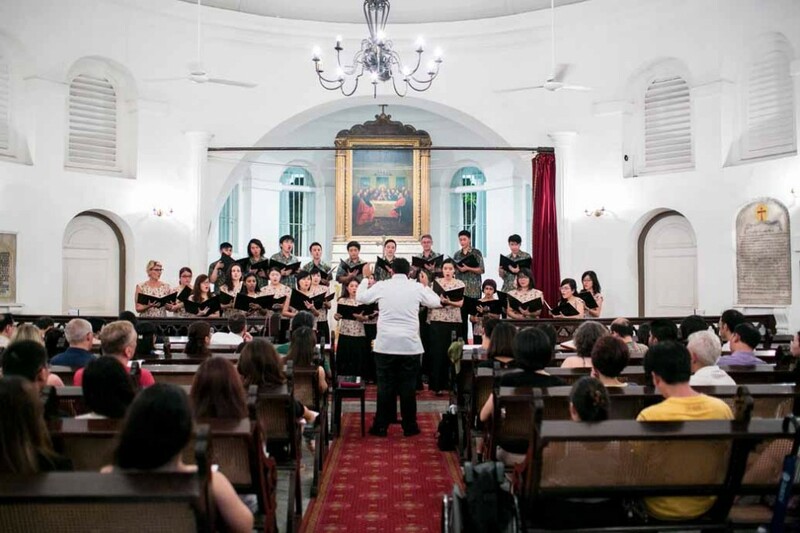 Students, retirees, and mid-career professionals of varying ages, ethnicities, religions and nationalities all call themselves Vox Camerata, forming the members of what has since become Singapore’s longest running non-auditioned community choir. Because we do not audition new members, many of our singers are people who would otherwise have never been able to experience both the joys and tribulations that are unique to the choral singing experience. Much of our joy—and many of our tribulations—come from us setting high standards, putting in hard work, and constantly challenging ourselves; there are no shortcuts where music-making is concerned after all. Our diverse repertoire paints a truly global soundscape that showcases the breadth and beauty of choral music. Our rehearsals are fun and lively, but also passionate and focused. For those new to being a chorister, practices often prove to be educational. By consistently learning and growing together, we Vox Camerata prove that open minds and open hearts have and will continue to produce excellent choral music worth celebrating. We believe in celebrating excellence. We also believe that no celebration is complete without others to celebrate with. Vox Camerata has thus built up a distinguished reputation as reliable partners and collaborative community builders within the Singapore choir scene, on top of being proficient performers. Vox Camerata was honoured with an invitation to perform with Tim Eriksen at the Esplanade Recital studio for the 2014 Tapestry Festival. We were also honoured with another invitation, more recently this time, to perform at the Singapore Choral Festival 2018. As part of our efforts to foster stronger bonds within the music community, our Musica Intimae annual concert series have featured both local and international guest performers. This includes Singapore Armed Forces Band Director Ignatius Wang, soloists Soprano Akiko Otao and Bass Brent Allcock in 2017, and The Crescendos, The NUS High School Choir, and Woodlands Ring Secondary School Choir in the 2018 edition, which we performed to a full house at the historic Victoria Concert Hall. We also continue to partner with local charities and non-profits, such as the Singapore Cancer Society and Beyond Social Services, to bring choral music to the underprivileged among us. This is all on top of our active participation in celebrations of the arts such the Singapore Heritage Festival and Singapore Rhapsodies @ National Museum. We are Vox Camerata and we are passionate, silly, energetic, overworked and fun. We love food. Some of us are perpetually broke. We are as idealistic as we can possibly be while being as pragmatic as we possibly can. We are a non-auditioned community choir. We believe that a good chorister can be anyone, can begin singing at any time, and can come from anywhere. We are Vox Camerata and we are proud to sing for everyone we can, with everyone we can. Don’t just listen to us.